The Finnish open forest data system, launched in March 2018, has become enormously popular. Anyone can view data on forest site conditions and timber stock from 60 percent of Finnish forests, with no passwords required. The grid data covers 60 percent of Finnish forests, including protected areas. ‘Within two years, the coverage will reach 70 percent and later, after the next inventory, even more,’ says Jorma Jyrkilä, in charge of forest data services at the Finnish Forest Centre. The data on forest compartments covers only private, family-owned forests, which, however, form the major part of forests in Finland. Of these forests, 92 percent is covered by the data, related to harvesting, state aid to forestry and forest sites under statutory protection. What you cannot find in the open forest data is who owns the forest. This can be accessed through another service, but only if allowed by the forest owner in question. The open forest data is gathered by means of laser scanning and aerial photography. A guide to interpreting it is based on measurements on sample plots. The data can be viewed in three ways. First, data on individual sheets of the topographic map or on maps covering individual municipalities or regions can be downloaded. One can also simply browse the data or use it directly through a special interface. ’It’s been really popular. We have seen over three million map downloads in just one year,’ says Jyrkilä. One of the purposes of the open forest data system is to provide a basis for developing new tools for forestry and other forest-related activities. Five such tools are presented here. The Bitcomp company has developed the WoodsApp application to assist timber buyers and forestry service enterprises in finding forest sites for which they could make an offer to buy timber or to carry out forestry work. A sawmill needing timber can, for example, look for suitable forest compartments for offering to buy the timber, perhaps close to the facility or to where the harvesting machinery is or will shortly be operating. The search and filter functions of WoodsApp offer various parameters for searching for suitable sites. The map database allows notes to be made and photos to be uploaded. The application is supported by desktop computers as well as mobile devices, so it can also be used in the forest. The map data is updated parallel to the open forest data. In addition to this, data on future harvesting sites is included on the map. Applications and decisions on state aid are shown by the service, allowing forestry operators to see the forestry operations being planned and possibly worth making a bid for. Nature protection sites are also shown on the map, as well as cultural heritage sites and information related to the maturity of the forest. 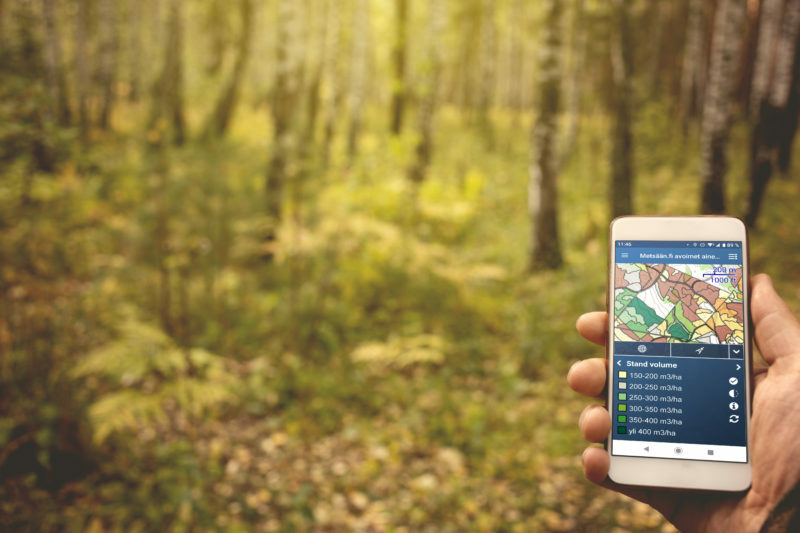 The Arbonaut company recently launched its ProMS Mobile application, which enables the open forest data to be utilized by mobile devices. The application allows the user to view sites which are planned to harvest, data on valuable nature sites, and the forest age, for example. Thanks to the application’s navigation function, locations are easy to find while in the forest, and the routes used can be saved for later use. Using the application to access open forest data is free of charge, and various extras are also available against payment for a better visualisation and management of the data. Examples of the pay-based extras include data on property boundaries, passability of terrain and average height of trees. The application also contains plenty of background data, such as the timber stock in a forest compartment and the timber stock report of a forest holding. The application can also be used offline, provided the necessary material is downloaded beforehand. In addition to this, it can be used to follow up and create reports on forestry activities. ProMS Mobile forest data application on a smartphone. The Tapio ForestKIT forest data system by the Tapio company is envisaged for forest professionals. It is designed to help with the management of forest information, forestry planning and the management of forestry work. ForestKIT allows you to create forestry management plans, plan harvesting sites, estimate the value of a forest holding, plan and manage forestry work and maintain stock data and customer registers, using a computer or a mobile device. The system gives access to all open geographic data systems, including aerial photographs, property boundaries, protection sites, cultural heritage sites and virtual images of terrain contours as well as the heights of trees derived by laser scanning from the whole country. An annual licence fee allows the use of detailed topographic maps, maps of forest maturity and soil, and surface water flow models. Thematic maps created from the open forest data, such as harvesting or other forestry management plans are available. ForestKIT users can print out forestry management plans or send the information and maps of a site to a forestry worker’s mobile phone. It is also possible to forecast the development of forest compartments and determine the value of forest holdings. One of the purposes of the system is to help local authorities, parishes, jointly owned forests and other large forest owners to manage their forest resource data without outside help. It is also used by forestry service companies that create forest management plans on behalf of larger forest organisations. ForestKIT is compatible with the data systems of most of the largest Finnish forestry stakeholders, such as Stora Enso, UPM, Metsä Group, the Forest Centre and the forest owners’ associations. By now, ForestKIT is used on forest properties covering 1.5 million hectares. The RoadsML company’s mobile application Metsään Tie (Road to Forest) uses smartphones to evaluate the condition of forest roads. The phone’s positioning function saves the route driven on to the phone’s map, and its sensors record the vibration during the drive. The application evaluates the condition of the road according to the strength of the vibration. Afterwards the driver can also record remarks on the road condition or such things as the presence of stones or holes, or the need for snowploughs. The data and remarks are collected on the digital map of the Forest Centre, where it is accessible to anyone. The application is self-learning: the more extensive the input, the more accurate it will be. The goals is that in the future the app will evaluate road conditions on the basis of vibration alone. The forest industry is able to use the application for planning operations on different harvesting sites and the routes of timber lorries between them. The application helps the forest owner in choosing which sites to harvest for sales. The need for this service is illustrated by the fact that vehicle weight restrictions, for example, are not published anywhere at the moment. The Metsään Tie application has been downloaded 500 times after being launched at the end of January, 2019. 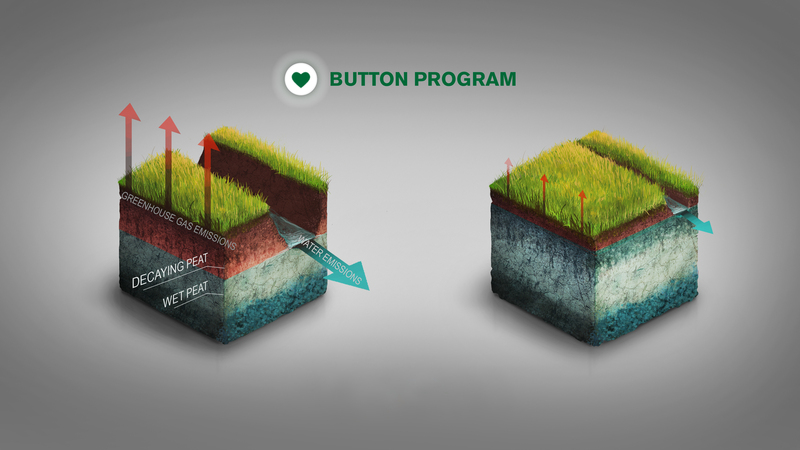 The Button Program company produces a map service for sustainable land management in cooperation with the Department of Forest Sciences at the University of Helsinki, Natural Resources Institute Finland, the Finnish Environment Centre and GTK Geological Survey of Finland. The project is a part of the Baltic Sea Project. The purpose of the service is to develop an application utilizing open geographical data on agricultural parcels and forest resources in order to control and decrease greenhouse gas emissions as well as emissions into waterways from wet soils. The application map shows agricultural parcels and forest compartments on peatlands. An appropriate groundwater level maintains a dry, productive soil layer for the roots of crops or trees and protects from floods. This will minimize emissions from ditches into waterways and climate gas emissions from the oxidation of dry peat layers. The application estimates the decreases in emissions after measures to control the groundwater level. All in all, the map service contains 70,000 agricultural parcels, with a total area of 200,000 hectares, and 2.2 million hectares of peatland forests. According to estimates, the application makes it possible to avoid carbon dioxide emissions by an amount corresponding to the emissions of 100,000 Finns. The project also aims at offering the general public the opportunity to support landowners who use it to mitigate climate change. The Button Program aims at changing the situation in the left-hand image. Here, effective draining increases soil productivity, but leads to significant emissions into waterways and atmosphere. The application calculates the optimal groundwater level allowing both acceptable crop yields and lower emissions, perhaps by omitting to restore drainage ditches, as shown in the right-hand image. Addition, 18.4.2019: As to the Metsään Tie (Road to Forest) application by company RoadsML, the source of the article was Metsälehti magazine.